You may wonder what I have been doing...not posting and all. I actually think I have finally gotten back in the groove so to speak. I was in a slump after the weaving conference I had attended and couldn't quite get into doing anything. Well, that isn't actually true...our Guild had a workshop on harness-less weaving and I learned how to use a triangle loom. I borrowed one from Hilda and proceeded to weave quite a few triangle scarves. I don't think I will actually admit to how many... but really quite a few. I kept wondering...hmmm...how would that yarn work on the loom? Or perhaps this yarn? Since I had just cleaned out and organized my stash...all my yarns were fresh in my memory. I'll take a picture of the results sometime and post. I did finally start on my group project for our tapestry group...you can see what I am working on here. Anyway, as I started weaving that tapestry I started thinking it might be a fun thing to do on my sixteen harness loom...so I tried it out. Here is the result. 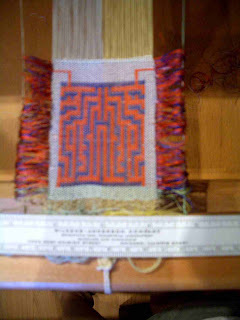 Sorry about the picture quality - its tough to get a good picture while the piece is on the loom. It's a maze - obviously. One can go in one side and out the other. Pretty intriguing. I am going to play around some more on this concept. But I still like bugs. Trilooms are so much fun aren't they. I love your mazes!